Skateboarders are pretty extreme, aren’t they? Jumping, climbing, falling and nearly flying on a piece of board with four wheels is far from safe. However, these guys do it with style, poise and a sense of cool that most other sports people can’t even muster close to – they wear Vans footwear to work each day, which says a lot. Skateboarding has really given us some heroes and many are household names for people who wouldn’t know the first thing about skateboarding. 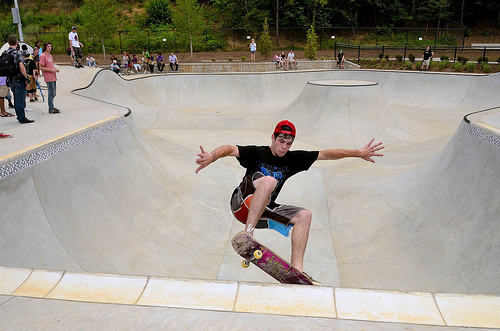 In fact, there are many people who never skateboard who await the release of new skating computer games and media with anticipation each year. It’s a hell of a sport. So, let’s look at some of the best of all time – whoever they are? When you think of infamous skateboarders, most people with an interest or without even a notion will mention Hawk. Tony Hawk has been around for years and has brought skateboarding to the masses with his distinct style and cool, calm nature. His ability on a board is astounding and even though he is retired since 1999 is still the most well-known of all boarders. Hawk has 10 video games to his name and counting and is the first skater to pull off a 900. He still remains unchallenged and until he is beaten, he will be probably the most famous boarder ever. Mullen came to light in 2001 in the Globe: Opinion skateboarding video and showcased amazing technical skills and has stayed at the top for the last decade or so. His videos still continue to awe and he is very big in the research and development side of the sport. There is probably no boarder who can skate as spectacularly as Danny Way. In his time he has achieved a lot and much of it is very notably showy. He has claimed the world’s highest free-fall, most air and also the world’s longest jump. He has also spent a lot of the last 10 years injured thanks to problems with his knee and has had to undergo numerous operations to correct the issue. He has even jumped over the Great Wall of China, making him the first person to do so without a motor powering him. Danny achieved this feat with minimal body armour, wearing a pair of Vans shoes (one of his sponsors) and a board which was more or less standard issue. A really incredible feat! This guy divides opinion, but is loved by as many as he is hated by. Sheckler was the youngest pro to get gold at the X Games and has amazing skill and ability. One of the reasons he is so divisive is his clean cut image and the fact he is seen as a corporate poster boy. He however, has shown doubters wrong and really impressed on a skateboard, proving those that doubted him wrong. 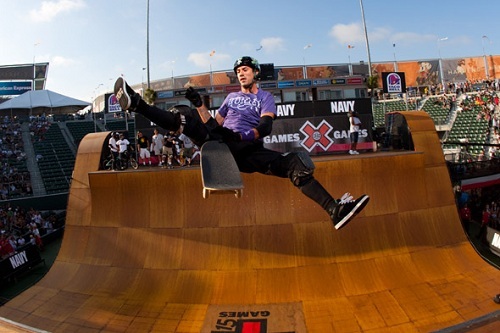 After winning the TransWorld Best Vert award three times at the start of the 2000s, Burnquist has won numerous other large competitions and is seen as one of the world’s greatest skaters. He has also set up a number of charities and has been a called for ecological awareness, using his notoriety to push causes close to his heart. Cormac is a big fan of extreme sports and writes on a range of subjects including travel, fashion and sports. This entry was posted in Featured, Land Sports, Skateboarding and tagged extreme sport, Extreme Sports, skate clothing, skate fashion, Skateboard, Skateboarding, sports, sports celebrity, sports star, sports stars. Bookmark the permalink.